I was very fortunate to have been brought up in an area of East London undergoing major social change in the late 1950’s. On leaving Grammar School it was clear that I had benefitted from an education that was second to none. Whilst adults around us were angry and frightened at the emerging diversity of cultures, we were taught to embrace and value these differences. It was not until 1984, and now with a young family, that I heard of the Boycott Nestle Baby Milk Campaign. As a young mother I was appalled at the injustice – by big corporations – to find markets, at any cost, for their products and my passion for fairness and the realisation that I could be part of the solution through the purchases I made, led me into the world of Fair Trade. I joined IFAT (now WFTO) in the 1990’s and it felt good to be part of a global movement, dedicated to improving the livelihoods of producers, who struggled to make a living. Fast forward 30 years and the decision to become a WFTO Guaranteed Importer member of WFTO completed the journey. WFTO is home to over 400 members, across 70 countries, it is as much a culture as an organisation -it’s like one big global family. At its core there is a set of underlying principles, it is an attitude of mind rather than a set of rules and regulations. Like any large family there are differences of opinion and disagreements within WFTO, but with a combined vision of working towards a sustainable and fair global economy, these issues are overcome by working together - putting people and planet first. In a patriarchal society customs are an integral part of a woman’s life and women are expected to take care of the house and children, even when they have full time jobs. Having a ‘women only WFTO supply chain’ can be advantageous for women producers as there is an understanding of the archaic thought that ‘a woman’s place is in the home’ and this is where the concept of equity and equality come in. I have seen at first-hand the problems facing women producers as they strive to make products that appeal to consumers, and then cope with the added burden of bringing them to the ‘open’ market to find buyers who will give them a price that covers the full cost of production. WFTO Women producers/importers have the opportunity to influence the equity in the supply chain and lift communities out of poverty, through long term trading partnerships. Over 50% of our WFTO GS producer membership are women and as a female importer I share their passion and dedication to provide work for their local communities, and wanted to ensure my business embraced and supported them. It is with this in mind that we are developing an exclusive range of WFTO Fair Trade Tartan products that secures both equality and equity in to the WFTO Guaranteed Fair Trade supply chain, with our World Fair Trade Tartan partner and WFTO producers globally. 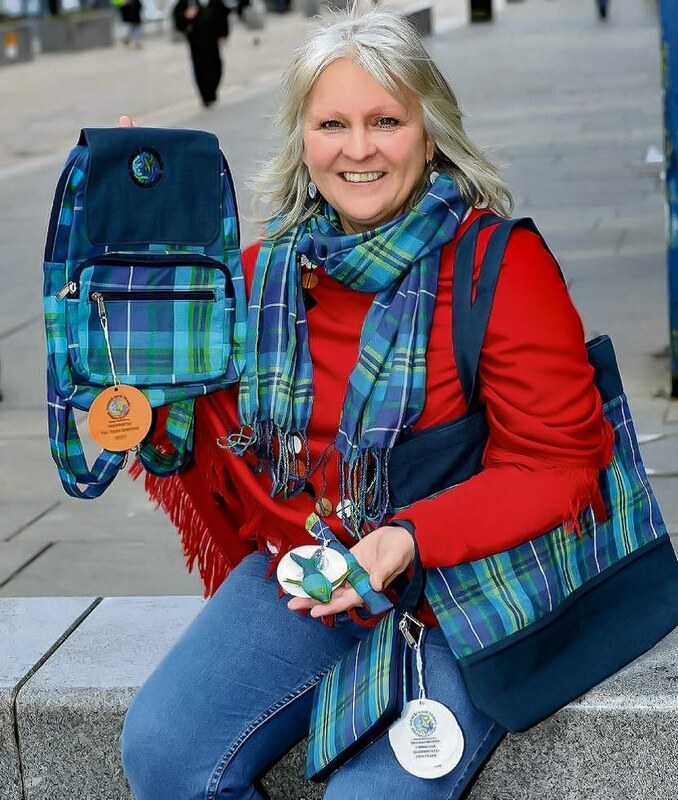 The concept of the WFTO Fair Trade Tartan accessories is to ensure that producers receive the maximum profit for creating the finished product. Our first WFTO Tartan partnership is with Guaranteed Member Villageworks, Cambodia where they are making the first range of WFTO Fair Trade Tartan accessories. As an organisation they fully embrace diversity and this helps create sustainable livelihoods for the artisan weavers and sewers. We are working collaboratively with World Fair Trade Tartan to build capacity and measure the social impact this product will have for the producers of the WFTO Fair Trade Tartan products, which will see an increase in the family income and should lead to an improvement in health and education opportunities for the children, making it easy for the responsible consumer to support. “For consumers ethical trading, is most crucially about transparency and accountability. Communications should not be about forcing consumers to choose between or prioritise the plethora of sustainability issues that will arise in a company’s supply chain. It is about making the responsibility choice the easy choice. Marilena Lazzarini, President Consumers International. “On the path to gender equality, we need gender equity. In order to have gender equity, we need to change the narrative and focus away from fixing women and put it squarely where it belongs – fixing the system. A system that has generated a leaky pipeline and suppressed economic opportunity at all levels – individual, family, company and country”. Katicia Roy is an Ambassador for Gender Equity.